Several years ago, a special disgorgement line was added to the production facility operated by the CRVC (Coopérative Régionale des Vins de Champagne). However, the new system imposed several technical restrictions on the operators of the facility. Due to the large amount of space required for the disgorgement line, the dosing system and dosing machine are housed on different floors. From a technical perspective, the fluctuating pressures during the dosing delivery present quite a challenge. To ensure maximum quality and optimum taste, our customer requires precisely controlled dosage delivery during disgorgement – a special step during Champagne production. This is to compensate for the loss of liquid after the removal of the ice pellet while simultaneously exerting a decisive influence on the subsequent taste of the Champagne. 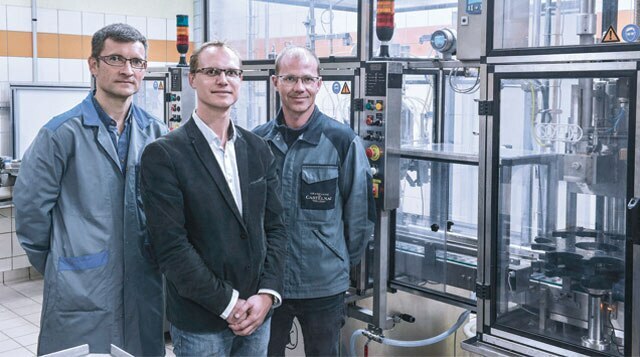 To overcome the existing challenges and to implement a technically flawless solution, CRVC and Bürkert joined forces to create an automation solution that would reliably and effectively fulfil all the requirements of the control function. Starting with a feasibility study, initial trial runs and the right programming, this close cooperation has led to lasting and reliable operation of the system. When it came to automating the dosage delivery system, our customer trusted the application expertise and the components offered by Bürkert. One particular advantage is the optimum coordination of individual components with one another, which ensures reliable results. At the heart of the solution is the Type 8619 multiCELL transmitter/controller, which records the different measurements and precisely regulates the dosing. The controller offers a simple and intuitive operating interface with a large graphics display as well as the option to connect different sensors directly. Additional components, including a process control and diaphragm valve as well as pressure sensors, work together and enhance the automation solution. By working hand in hand, the maintenance department at CRVC and we realised an automated dosing delivery solution. Whereas the technicians at CRVC were responsible for the installation, we handled the start-up, parameterization tasks and provided training for the employees on site.